Howdy, Gameologerinos, and welcome to our weekly open thread. I’m just going to put it out there: I’m not playing anything terribly exciting this weekend. I’ve been rhythmically tapping away at the recently released, unfinished version of Crypt Of The Necrodancer, a hybrid music and role-playing game that has you trudging through dangerous dungeons in time with the killer soundtrack. It’s been a fun time waster, but it feels like just that. I can’t shake the thought that while playing it, I’m one of those drinking bird toys that perpetually pecks at a glass of water. In my case, it’s my index or middle finger rhythmically hitting the arrow keys. So while my gaming plans may be dull, here’s something else that caught my interest. At Gameological, we’ve talked a lot about speedrunning and glitching and all that meta-gaming goodness. (We need to come up with a name for this sort of play. I’ve read “alternative gaming,” but come on.) Beyond simply taking in the spectacle of these feats, I like to watch players subvert something so familiar—taking the laws of a world we know and love and tearing them apart. Take the video referenced in this article that I spotted on Kotaku today. 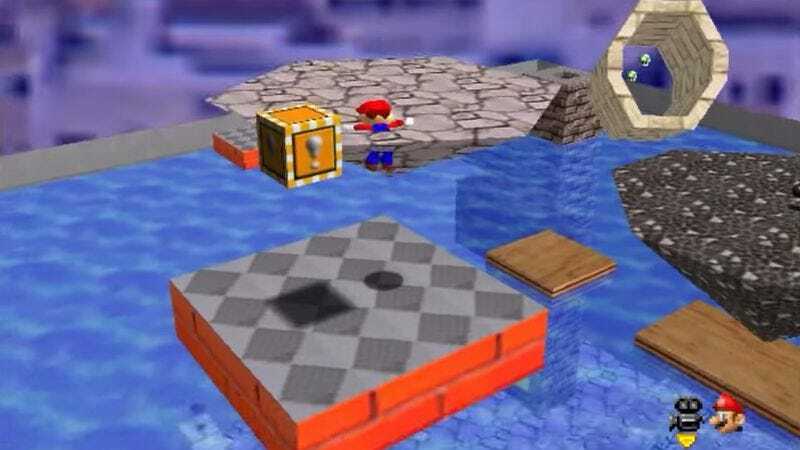 In her post, Patricia Hernandez wrote briefly about the history of a Super Mario 64 phenomenon known as “The Impossible Coin.” It’s a coin placed inside a piece of the level “Tiny-Huge Island” that, at one point anyway, was thought to be impossible to collect. Players can see the coin by standing in a certain spot and manipulating the game’s camera, but you can’t reach it with normal means. It’s a great little explainer that breaks down some of the rules that hold Mario 64’s world together and how they clash to create this Mystery Goomba phenomenon. Obviously, the next question was: Now that we know where this Goomba is, can we kill it somehow? Well, several months later, pannenkoek2012 made another video testing out every method he and all his commenters could think of. The result is a fascinating 10-minute journey through his bag of Mario 64 glitch tricks, narrated by the YouTuber himself. If you’re only going to watch one of the videos in this post, make it this one. It’s a beautiful thing, watching the laws of Mario 64 snap into action and bend and crumble. The moment in that last video where pannenkoek2012 captures the explosion from a Bob-omb in Mario’s hat and redeploys it across a gap only to have the Goombas push it around had me screaming “WHAT? !” at my monitor. I don’t think I’ll ever get tired of watching people tear into these classic games, exposing their inner-workings and manipulating them in the name of science. Because really, that’s what this is. Each game we play is a new reality with its own laws and physics. Fortunately for the scientists who poke and prod at those rules (the speedrunners and glitchers of our world), these virtual universes are almost always predictable, and their rules are easily broken. And so we get to see spectacular feats like the ones above that should otherwise be physically impossible.